The new public Car Park in Bungan Lane at Mona Vale is Pittwater Council’s first major infrastructure project it it’s 22 years of existence. Many now feel there are major shortcomings with the modified design and a far better outcome could have been achieved. The original car park design approved in 2002 was changed in 2012 by Council Staff under delegated authority and has led to many issues of concern. A multi storey car park for this site was approved on 2002. At the same time the adjoining Aurora and Gateway Buildings were excavated down for their 2 basement levels of car parking the Council car park site should have also been excavated down and construction commenced. Excavation costs would have been reduced as the combined sites treated as one. This approach makes perfect sense but this was not adopted by Pittwater Council. The result is a car park built at ground level with 4-storey height split over 8 split levels. Pittwater Council state the car park complies with accessibility standards with disabled spots provided on the ground level. But why build it to the minimum, why not make the whole car park accessible with a lift. Council responds to no lift in the Report dated 17 November 2014 where they state – “It is noted that as part of encouraging a healthy lifestyle, the use of stairs instead of a lift is a healthier choice”. Tell this to the people that have hip and knee replacements and other mobility issues. When all the ground level Disabled spots, the “Mothers With Prams” spots and other spots are full, then the remaining 80% of the car park is useless to them as the upper levels have only stairs for access to the ground level. A lift installed in the centre of the building would have serviced all eight-split levels. Access from this car park site to the Post Office existed for over 50 years. The original car park plans approved in 2002 showed this would continue. Then ten years later in 2012 Pittwater Council staff prior to construction commencing sought design modifications, which resulted in this access being removed, despite vehement objections from Australia Post. At this same time Pittwater Council then approved rear access to the 2 adjoining properties, the Florist shop and Aussie Home Loans. Where’s the fairness in this? Access from the new car park to the Post Office is now a very long circuitous trip via either Waratah Street or Mona Vale Road. It would appear the car park was built to a 2.1 metre height standard. This was not consistent with the advice in 2012 from the Roads and Maritime Services (RMS) and The Australian Standards where minimum head height must be 2.2 metres. To rectify this many concrete overhead structural beams had to be cut with concrete and reinforcing steel removed to gain the extra 100 mm height. Concerns are now raised that in doing this it has affected the Structural Integrity and Fire Rating of those beams. “Concrete Cancer” is now also a concern in that building regulations require 50 mm concrete to cover reinforcing steel, which now does not exist. Corrosion of the remaining steel in the concrete beams may result, as the site is less than one kilometre from the ocean. A perfect opportunity has been lost to provide amenity in the form of public toilets in this car park project. As with the no lift why does it have to be built to the bare minimum, why not install a lift and toilets for convenience and a far better outcome. Council’s response to no toilets is in the Report dated 17 November 2014 where they state – “toilet facilities can be used in the adjoining developments”. One would think the Owners and Strata Managers of those adjoining buildings will object to the increased use of their toilets by the general public visiting their building only to use the toilets but apart from this Council’s statement has no merit. The Aurora and Gateway Buildings referred to by Council have no toilets on the ground level and no others accessible to the public. The Medical Centre in the Gateway Building has toilets that state for Medical Centre use only and would obviously not permit 100’s of people on a daily basis just wandering through the reception area to use their toilets. The Gateway building has upper floor toilets but they are accessible only by a special swipe security key. The closest public toilets are at the rear of the Memorial Hall in Park Street, which is a 900 metre round trip. 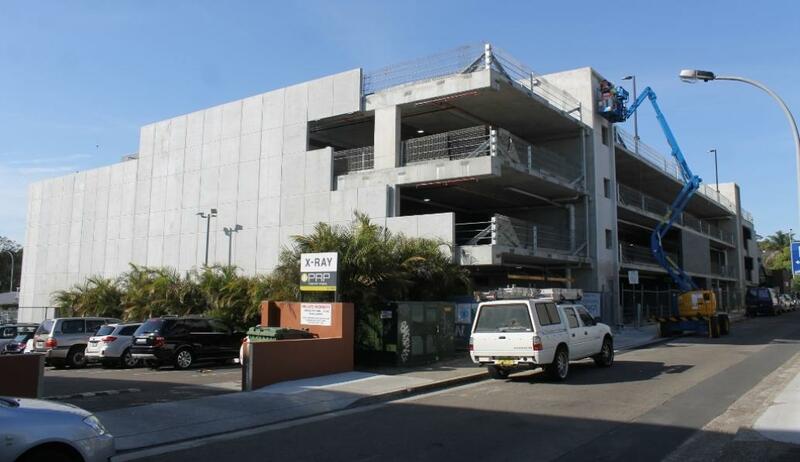 This new public building should have had toilets and Pittwater Council’s response, has not merit and is uncaring when there are over 4.8 million Australians that suffer from incontinence, which is 18% of the current population of Australia or nearly (one) in 5 (five) people. There are 3 “Parents with Prams” parking spots on the ground level in the new car park. At the Council meeting 17 November 2014 the Councillors were informed by a speaker that the spots at 2.6 metres width, were not wide enough as they were only the width of a normal car parking space and would be useless for the designated purpose. They were told a Traffic Report dated 8 December 2011 submitted with the modifications in 2012 and tabled at the meeting states there would be 3 spots at 3.2 metres width. Also that a document from the Hill’s Shire tabled at the meeting states “Parents with Prams” spots must be 3.2 meters wide and that the spots in Woolworth’s car park at Mona Vale are also 3.2 metres wide. A Councillor asked a question to Staff why the spots where changed from 3.2 metres width to now be only 2.6 metres and the reply was, to maximise the number of other car parking spaces. The outcome from the Council meeting is that the “Parents with Prams” spots in the new Pittwater Council car park will not be altered and will remain at the inadequate width of 2.6 metres. The original design approved in 2002 had both the ingress and exit driveways located together at the northern end of the building. As part of the redesign in 2012 Pittwater Council staff changed this where the previous single lane exit now became a dual lane exit 8.5 metres in width at the south end of the building. The resulting exit is dangerous for both motorists and pedestrians. The Australian Standard 2890.1 (2004) requires sight triangles of dimension 2.5m x 2m to be kept clear of obstructions at driveway exits to ensure adequate sight lines are provided for drivers to pedestrians on the public footpath. These sight triangles have not been provided and will require significant removal of built form at the exit with 800mm of the building corner removed on the northern side and 2 metres removed from the southern side. Pittwater Council was reminded of this Australian Standard requirement in a letter from the RMS dated 15 March 2012 prior to approval of the modified design, but obviously disregarded the advice. This is a major concern as there have already been many near misses with pedestrians almost being hit by vehicles exiting the car park as they walk across the very wide 8.5 metre driveway. One incident has already resulted in fisty cuffs between a female driver and female pedestrian. Drivers exiting the car park cannot see pedestrians walking along Bungan Lane approaching until the front of their vehicle has already crossed the footpath. This is far worse when a parent is pushing a pram, which is up to 1.5 metres further forward than the parent’s vision. The original design from 2002 showed sight lines that did comply with the Australian Standard marked on the plan but the modified plan in 2012 does not show these and does not comply. Accidents will result. Currently only one lane of the driveway operates for vehicles exiting from the Aurora and Gateway Buildings with 232 vehicles. What will happen when the Council car park actually opens with another 218 cars are added then totalling 450 vehicles using this exit. The Traffic Report indicates there will be one vehicle every 15 seconds using the exit. The relocation of the exit driveway also results in it now being directly opposite the Delmege Building car park exit with another 200 vehicles exiting at the same location. In both instances drivers are looking left and right with inadequate sight lines to pedestrians, they are also looking for approaching vehicles in Bungan Lane and too much is happening at one time. Little attention is being given to cars exiting from the car park directly opposite and already head on collisions have nearly occurred. A further issue is that of vehicles queuing to the intersection of Mona Vale Road with numerous observations with 15 or more vehicles can be queued back at any one time from the intersection of Bungan Lane and Mona Vale Road. This line of vehicles goes well past the dual lane exit of the new Council car park and whilst currently only operating at half the number of vehicles that will exit when open, even now drivers cannot exit the car park because of this queue of vehicles along Bungan Lane. What then results is an additional queue, which extends back into the new car park as well. Had the driveway remained at the northern end as was approved in 2002 this problem would not exist and vehicles could have exited to Bungan Lane without any problems. Many drivers are complaining that the turns in the car park are too tight. Bearing in mind the car park is currently only being used for access to the Aurora and Gateway Buildings so there are only 2 turns for these drivers to take at present, one on the drive in and then one on the drive out. The raised kerbs on the turns are black with rubber after vehicle tyres have scraped along them indicating the degree of difficulty in negotiating the tight turns. In one instance a driver has already hit the kerb and it resulted in the front tyre blowing out. The sidewall of the tyre was torn and the NRMA had to be called to assist. The driver commented saying, “This is the bloody carpark that everyone’s complaining about! " While the tyre was being changed, one of the drivers of a passing car from the Gateway Building reported that her office has blown three (3) tyres in this new Pittwater Council car park already. An analysis of the turn from the Gateway Building to the exit ramp in the new car park has indicated it does not comply when assessed to the Australian Standard AS 2890.1 for vehicle swept paths. Article and Pictures by Pittwater Alliance, 2014.